Nick and Lesley’s desire for a better life in the countryside was a long-held dream. 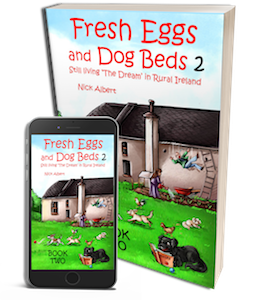 Unforeseen events and a leap of faith forced that dream into reality, but moving to rural Ireland was only the beginning of their story. Foreigners in a foreign land, they set about making new friends, learning the culture and expanding their collection of chickens and unruly dogs. But their dream home was in desperate need of renovation, a mammoth task they attacked with the aid of a DIY manual, dwindling funds and incompetent enthusiasm. With defunct diggers, collapsing ladders, and shocking electrics, what could possibly go wrong? Will their new life live up to expectations, or will the Irish weather, dangerous roads, and a cruel twist of fate turn this dream into a nightmare? Nick Albert was born and raised in England. After a hectic career as a training consultant and sports coach, Nick, and his wife, Lesley, decided it was time to leave the stress of city life behind. In 2004 they made the sudden decision to begin a new life in rural Ireland – a country they had never before visited. There they bought a dilapidated farmhouse, and with the aid of a second-hand do-it-yourself manual, began renovations on their new home. When the refurbishments to the property and their lives were complete, Nick began writing full-time.